Tim Stevenson and Sundance Martin have been friends since the late 80's sharing both an over-the-top (and often over the line) sense of humor and of course an intense love for music. They began playing guitar together in the early 90's and quickly found that the genres of the day were too narrow for the music that they wanted to create. Bands like Rush, King's X, and Primus found themselves alongside bands such as Slayer, Entombed, and Pantera. Their first band, W.L.A. (a mysterious acronym that has baffled, disturbed and confused many over the years), was formed during the end of their high school days and you could find them playing anywhere they could get on the bill. Their sound was raw and stage presence non existent, but the music was not what you would expect from your ordinary high school garage band. A musical apocalypse then descended and it's two headed Avatar, grunge and gangsta' rap, devoured the airwaves. It was during this time that W.L.A. split, with Tim moving to Boston to attend Berklee and Sundance moving on to other projects. Unlike many partings, this one bore no true sorrow. Tim always stayed in touch and upon returning home for vacations would produce songs and even albums for Sundance's other bands. Sundance stayed active forming first Bobby's Bag, a band best known for its enlightened view of the vegetarian lifestyle, and then DAMD, a collaborative work with Tim that marked the beginning of what would become Tandjent. The DAMD album (now out of print) while good, proved to be somewhat schizophrenic in its composition. Some songs were heavy while others were not. There were songs with singing and songs with screaming. 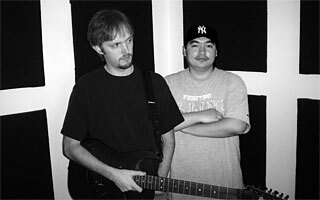 Tim and Sundance were determined to create a cohesive album and hold it to their exceptionally high standards of production. The seed of Tandjent was formed in the years around 1999-2001, not long after Tim had graduated from Berklee College of Music in Boston. Many of the riffs that would eventually become the songs for No One Will Hear Us originated at this time. It wasn't until late 2001 that production of the album began in earnest. While there's no need to go into the minute details of this production, it certainly cannot be trivialized. Constant hardware and software upgrades led to a slow metamorphosis of the sound while the riffs and song structures went through numerous revisions as well. Throughout it all, for every step back there were two steps forward and every success seemed to merely create a higher standard.